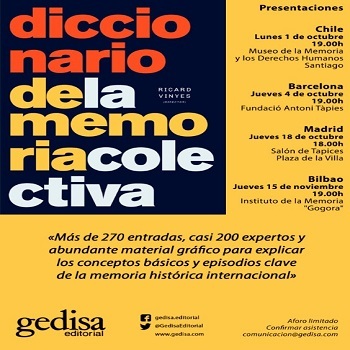 It is a great pleasure to share the news of the launch of the Diccionario de la memoria colectiva (Dictionary of Collective Memory) published by Gedisa (Barcelona, Buenos Aires). The dictionary is unique of its kind and since its first public presentation (October the 1st in Chile, at the Museum of Human Rights) the volume has been reviewed and acclaimed by the press as well as by specialized journals and reviews. This is the result of more than four years of work. Sponsored by the University of Barcelona through a generous research grant funded by the Ministry of Culture and Universities in Spain, it has put together a committee of 19 international scholars coordinating the work of 187 specialist who have produced 264 entries concerning all fields related to Memory representation (history, art, film, literature, photography, museums, etc). The Centre for Memory and Testimony Studies has actively collaborated through the work of some of its members: Colman Hogan and Kim Anderson have worked on the entries devoted to Indigenous memories, and Memory in Canada, and Marta Marin-Domine, Associate Professor from the Languages and Literatures Department of Wilfrid Laurier University has been part of Scientific Committee. Launches in Barcelona, Madrid and Bilbao are to follow during October 2018.